Just a reminder that we are now open this morning for orders until noon. Get your local food while it lasts! Thank you for your supporting your local farmers! Fresh Harvest, LLC: Fresh Harvest Cheese added! Just in case you missed it last night, The Bloomy Rind cheese shop added new cheeses to the Market! There are six new cheeses up there, Award winning and delicious from Southern Cheese artisans! Swing back by the Market and get youself some! Thanks, and we will see you onWednesday! I am back, after a nice long break. Please have Maryanne in your prayers as she has been battling with pneumonia for a long while now, and went to the hospital yesterday. RAW MILK IS AVAILABLE NOW! I also wanted to let you know that I have partnered with Johnston Family Farm to supply Raw Milk and expand supply, and can have it for you as soon as tomorrow. I have quickly uploaded all of their offerings. On top of raw milk, they also offer buttermilk, cream, chocolate milk and cheese. Some quick details on their products. Their buttermilk and chocolate milk is done in batches of 40 gallons, so they will process once they reach that request. The cream is frozen. Their cheese are pasteurized but made fresh. Since he didn’t give me weights, I hope to update that as soon as possible. Remember, all milk is raw and labeled for Pet Consumption except for the cheese. I will also be handling all the group orders, and submitting Mother Earth Meats today. Please take note that they have said there are no exceptions this time for late orders. I will leave market open until noon today so that you can get your orders in. We have planned some wonderful things for 2013. We will host another WAPF conference in March, details to follow. We are also making changes to both sites (Farm & GLG), to streamline and make ordering easier. So be on the look out for all those updates coming soon. If you are interested in bulk purchases at reduced prices, click on our new category ECONOMY SIZE to go directly to a list of available bulk items. When local urban farms are brimming with kale, collards, you-name-it, you will likely find bulk quantities of them in a new category we’ve set up. Category “ECONOMY SIZE” is now listed on the left side of the Market webpage. Need a walk through? Just call Tina at 727-515-9469. If you don’t want to place your entire order right away, you can always come back and place a separate order from other Growers before Wednesday noon when the Market closes. We are required to place our order with GCF early Wednesday morning and it will help us NOT to over-order. THANK YOU for working with us on this. VALENTINE’S DAY ISN’T THAT FAR OFF. Buy a gift for the Sweethearts in your life AND support LOCAL small businesses. Check our Q&A page for suggestions! 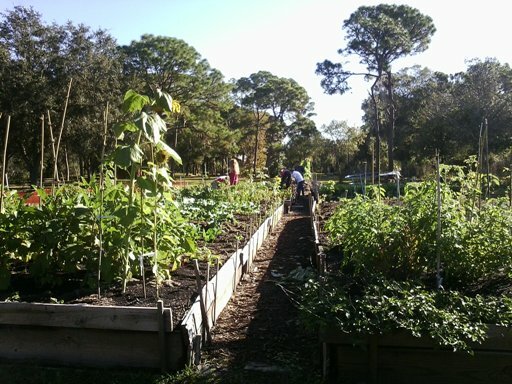 “SUCCESSFUL URBAN FARMING IN ST. PETERSBURG” on Feb. 9th, 1 PM Details are on Calendar of Events. This will be held every Second Saturday of the month and is open to the public. We will be asking for RSVPS to determine whether or not to hold each monthly class. Bring your friends and save $10 each on this valuable experience! You can now pre-purchase this workshop on our Market. This class makes a great gift for any occasion! RSVPs now being accepted. We will begin holding potluck socials on the 4th Saturday of each month, starting January 26, 2013. These events will be held exclusively for actively participating Market customers, growers, and volunteers and are meant to create a social atmosphere in which to network, share resources and experiences. Each event will include a brief informational lecture on subjects relevant to our group, including community building, growing and preparing food, health practices, to name a few. Presenters for the January potluck are Clark & Peggy Tibbits on “Intentional Community Living: 30 Years Experience”. An invitation to attend has been sent via Evite and RSVPs are being requested. I’m devoting the newsletter these first few weeks of the year to documenting in detail just how ALG works. I’ll spend some time next week talking about how growers get allowed in the market, and what standards they have to meet. But first, last week I promised I’d get into the details of how the market sustains itself financially. Many of you ask about that from time to time, and I’m happy to oblige. First off, we’re legally a sole proprietorship, and the market is just an extension of my wife’s and my small farm. We file a Schedule F in addition to our regular tax forms. When the market started in 2002, it was named “Locally Grown Cooperative”, but it was never legally organized as a co-op. Dan & Kris Miller, the founders from Heirloom Organics farm in Watkinsville, were always sure to run things in a cooperative spirit, and since they handed the business to my wife and I in 2004, we’ve tried to do the same thing. I’ve renamed it to “Athens Locally Grown”, but you’ll still hear a number of people refer to us as “the co-op”. We’re not a non-profit, either, but we’ve structured things so that over time the market can just cover its own expenses. Just like all of our member farms are sustainable growers, the market itself needs to be sustainable. So how does the market cover its expenses? One small way is through the memberships you pay. The $25 a year you give to the market is enough (to put it bluntly) to cover the costs of having you as a customer: banking fees from depositing your checks, paper and ink for printing, web hosting fees, and that sort of thing. What’s left over goes to helping fund farm tours, food donations to like-minded area groups and events, etc. We currently have 484 paid members out of the 3743 active accounts on the website. By far the bulk of our funding comes from the growers themselves. They generally pay a 10% commission on their sales through the site. This money covers the many coolers we use, the tables and shelves used to spread out and organize your orders, the truck we bought at the end of 2007, gasoline, the food allowance we offer our volunteers, rent and utilities at Ben’s Bikes, etc. During the slow parts of the year, the sales are usually not enough to cover our weekly costs, but in the busy times (late fall and early spring, for us) there is extra. If we plan things out well, it pretty much all evens out in the end. Last year, the total sales and memberships combined through the market amounted to $359,442. This is actually a very small decline from 2010, but the continual rise of so many other markets in the area is the biggest reason for that. (We used to be the largest farmers market in this part of the state, but only because the others were so small.) About 90% went straight to our growers, and the rest went to a food allowance for our volunteers ($400 to $500 a week), rent ($200/month), tables & shelves ($1000), our farm tours (about $750 total), web hosting, and transportation. The “profit” gets counted as personal income on our tax forms, and comes out to roughly $2000. I haven’t yet calculated milage allowances and other minor expenses, and I expect that the profit total will pretty much come out to zero when I do. The growers get paid out of the shared cashbox when they drop off their sales, during the hour before we open the market. Then, you arrive and pay into the cashbox for your order. We used to then rush to the bank to deposit the money to cover the checks we just wrote to the growers, but now the growers get paid the following week (money you pay via credit cards takes several days to reach our account). As explained elsewhere on the website, you are really ordering directly from and paying the growers yourself, but our shared cashbox system makes things convenient for you and them. (Imagine if you ordered from ten growers having to write ten checks when you picked up your items!) This shared cashbox system has so far satisfied the tax man, but it does mean that if you place an order and then never arrive to pick it up, we’re left holding the bag. For that reason, you are responsible for paying for orders not picked up, and that amount is automatically added on to your next order for your convenience. On the books right now (going back to 2007) is about $2672 of produce ordered but never picked up and so far never paid for at all (or picked up but paid for with bad checks). That might seem like a lot (and it is), but considering that the market’s sales total, that’s not so bad. In fact, it’s about a fifth of the US retail industry’s “shrinkage” rate, and almost all of it is owed by only ten people. Only $600 came from this last year. On the flip side, $5241 has been pre-paid into the cash box by people who pay online via credit card or who write large checks in person, and then draw down on that balance over time. There were 9749 orders placed last year, so that averages to $36.87 spent per order. There are no good studies on this number, but I’ve seen a few surveys conducted by the USDA indicate that the average customer spends $25 per trip to a farmers market. We continue to far exceed that average, which I think says a lot about the advantages ALG offers over the traditional market. And to your dedication to supporting our growers. So, in probably far too much detail, that’s how we operate financially. Our market might be more expensive to run than a traditional “booths and tables” farmers market, but that price buys a system that’s simple, time-saving, flexible, and in my opinion, just better. There’s no money in the bank, but the market is paying for itself and that’s my primary financial goal. If you’d like to talk with me in person about this or any other aspects of ALG, I’d love to do so. Just pull me aside when you come by to pick up your order. One administrative note: next week I’ll be in Little Rock for the annual Southern Sustainable Agriculture Working Group’s annual conference. Since Doug’s Salmon keeps his fish at my house, it will not be available to purchase next week. If you want some for then, order it now! It’ll return the week after. It’s the last chance to order local in January! Got a special occasion on the horizon? In addition to chickens , The Living Farm has 2 “outrageously tender” whole lambs for sale! You can even try making Farikal – a Norwegian dish of lamb and cabbage with the green or Napa varieties still available from Zephyros Farm & Garden! Plus, there are still processing apples available from Delicious Orchards! It may be -30 in Gunnison, but there is still local produce to be had. Madison GA: The market is now open!!! Please go to madison.locallygrown.net to order. I’ll see everyone Wed!!! As I slopped through the mud helping unroll hay bales in a cold driving rain with lightning crashing overhead, I felt like I was in a reality tv show about tough jobs instead of just feeding hungry cows on a Saturday afternoon. But it felt good to get the job done – us farmers take pride in the fact that our jobs can sometimes require a little determination and grit – and besides, we needed the rain. The weather outside is cold, so warm up with some of Carissa’s new tea blends: Happy Body, or Calming. They taste great hot or cold, and are made with herbs we grow and dehydrate right here at Cedar Rock Ridge in Conway. Herbs include lavender, chamomile, anise hyssop, catnip, and others. Also, enjoy some freshly boiled JUMBO peanuts! Have a great week. The market is now open. Go to conway.locallygrown.net/market to place your order. Hit the checkout button when you’re done, and you will receive a confirmation email when your order has been placed. Good night St. Croix! This week we’ve rearranged and consolidated the categories on the market to make it easier to find the products you’re looking for. Our growers have a lot of delicious produce and value added goods for sale this week. Take a look!